Here are a few well-known answers to the low pincer . d -attaching to the pincer stone with d (see 3-4 Point Low Approach One Space Low Pincer Contact On Top, by transposition). e -The thrust at e: 3-4 point, 5-4 approach, one-space low pincer, thrust. Tenuki: This is not a pincer that White can easily ignore: from the point of view of joseki and tenuki one can ignore White tenuki as a sensible continuation. It is played, though, in a small proportion of pro games. 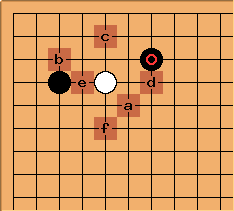 See 3-4 point high approach one-space low pincer, tenuki - the interesting point there is that Black's connection under isn't the most common way to play.